This portrait of Ferdinand VII entered the Thyssen-Bornemisza collection in 1935 and appeared in its catalogues from 1937. It had previously been published by Mayer in an article on Goya published in Pantheon. Two years later it was the subject of a report by that author written for potential purchasers of the canvas and including comments on style and attribution. The painting had first been made known to a wider public in 1910 when it was included in an exhibition organised by the City Council of Barcelona at a time when it was in the collection of Francisco de Goya de Sáenz. In 1929 it was again exhibited in Barcelona in the International Exhibition entitled Arte en España, in whose catalogue its owners were listed as Sres. Riva y García. 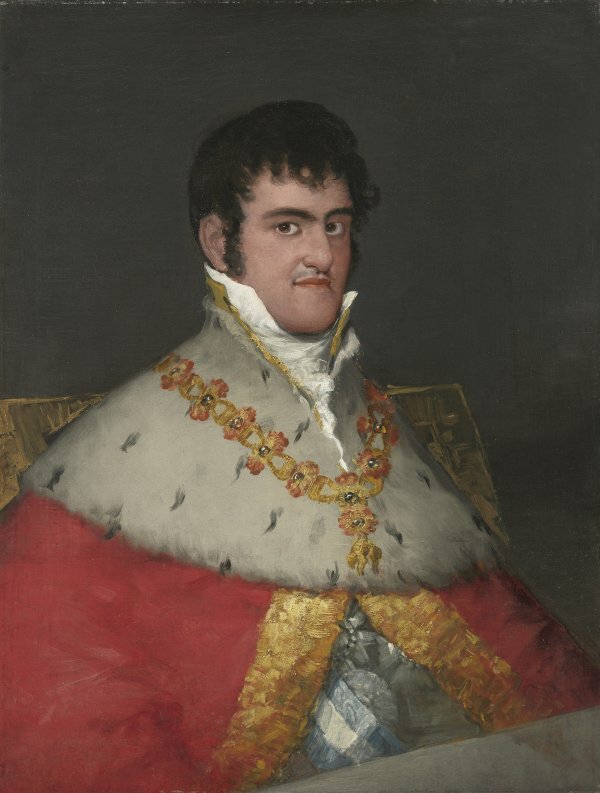 The canvas is one of a group of portraits of Ferdinand VII attributed to Goya and dated to after the end of the Peninsular War in 1814. The group was not a direct commission from the Spanish monarch and these images were probably requested by various public bodies and provincial institutions who wished to display the King’s portrait in their buildings. Ferdinand is depicted either fulllength or bust-length, always with the same expression and looking out at the viewer with his face in three-quarter profile. The backgrounds and clothing reveal differences between the various versions. The monarch posed for Goya in 1808 for the equestrian portrait now in the Real Academia de San Fernando in Madrid and the similarity between that work and some in the present group has led to the suggestion that Goya may have used the same preliminary oil sketch for all of them. It has also been suggested that he based himself on the drawing now in the Biblioteca Nacional in Madrid in which the King looks to the left and is depicted as younger. The present canvas is similar in its depiction of Ferdinand to the full-length version in the Museo Nacional del Prado of 1814–15, although the present canvas is simpler with regard to all its details, particularly the clothing and technique. The head is similarly positioned and framed by the high collar of the shirt in both works and the King is accompanied by his attributes of power, wearing the collar of the Order of the Golden Fleece, which in the present work hangs from a simpler chain than the one seen in the Prado canvas. The handling of the present version is less painterly and more linear, as can be seen in the treatment of the hair. The monarch wears the sash of the Order of Charles III in both paintings, but here he is seated before a table rather than standing. The table occupies the lower right corner of the composition while the back of the gilded chair on which the monarch is seated is visible behind him. Old photographs of this painting reveal areas of damage, in particular losses to the paint surface on the red mantle near the lower left corner, as well as further small losses in the face.